Emotions -- whether justified or not -- are the biggest hurdle to thinking objectively. I've found this to be true in my law practice. Sometimes, parties to a lawsuit hate each other so much that they'd prefer to pay their lawyers to continue the lawsuit rather than pay one another to settle the case. In such circumstances, I often find myself playing two roles. On the one hand, I must show my client support. The last thing he wants to hear -- while paying me lots of his hard earned money -- is any sympathy from me for his opponent. In this regard, I sometimes need to do a little hand holding, to give my client a shoulder to cry on, to let my client know that I'm in his corner no matter what. On the other hand, however, I'm not being paid to be a yes man. I'm being paid for my best professional advice, which in turn requires me to be objective. I'm not being paid to tell my client what he wants to hear, but rather what he needs to hear. This is true particularly when it means acknowledging the strengths of the other side. Balancing these two roles -- being empathetic versus being coldly rational and objective -- can be tricky, and I've struck upon a phrase to describe the biggest obstacle to thinking rationally about highly charged affairs. The phrase is "emotionally induced autism" and it comes into play when thinking about Guru and the Center. I struck upon this phrase after watching this great talk given by Malcolm Gladwell about his book Blink. Autism, in its most general sense, is a disorder that can -- among other things -- impede one's ability to process sensory data. 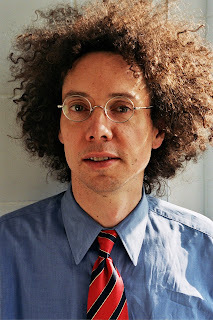 In his talk, Gladwell discusses the physiology of certain types of police encounters. Specifically, the impact of stress on the decision making of police officers. Gladwell suggests that police officers' experiences of intense stress temporarily work on their brain's processing ability in a way similar to how autism affects the processing ability of people suffering from that disorder. In other words, as police officers approach a scene of danger, various physiological processes -- like the release of adrenaline and increased heart rate -- impede the officer's ability to process many types of extraneous sensory data. This, in turn, enables the police officer to focus upon and respond to only the perceived threat in front of him or her. As Gladwell makes clear, however, this phenomena is both good and bad. In terms of personal survival, focus on the bad guy: good. In terms of blindness to data suggesting the "bad guy" isn't actually a bad guy: not so good. Gladwell uses the sad case of Amadou Diallo to great effect to illustrate the devastating downside to the autistic-like impact of stress and emotion on the reasoning mind. High emotions -- however caused -- threaten to disable one's ability to be objective. Case in point: trying to think rationally about Guru and about one's experience in the Center. Some people saw nothing bad. Their honest experience was a positive one, and many (though not all) of these people are still in the Center. When presented with evidence, suggestions, or arguments contrary to their positive experiences of Guru, many of these people naturally get defensive. Guru, the Center, the disciple-life is central to their identity. By challenging Guru -- and their personal, direct experience of Guru -- you are challenging them. When a person feels defensive, thinking rationally about a problem is more difficult. This logic applies to those on the other end of the spectrum, too. Some former disciples have nothing but bad feelings about Guru and their Center experience. Whatever the cause, their feelings are heartfelt. To acknowledge the good of the Center -- the help Guru provided them -- is almost impossible. To them, acknowledgment of the positive smacks of justification of the negative. This, of course, is especially true for those few who truly feel victimized by Guru, who feel that whatever good came of their Center experience has been far outweighed by the bad. For these former disciples, objectivity may not be possible nor perhaps advisable. Of these two camps, I fall squarely within the former rather than the latter. I saw nothing bad. On the contrary, my disciple experience was overwhelmingly positive. There were things I didn't like -- the proselytizing, the tattle-tailing, the weightlifting, the public relations campaigns in general -- and I've been upfront about that in this memoir. The effects of some of the meditations I had sitting in front of Guru, however, still linger with me today. And while Guru for the most part treated me with kid gloves, he wasn't so gentle with my sister Nirbachita. In other words, I'm personally aware that when looking back on my Center experience for explanations, I cannot simply extrapolate in a straight line from my experience to some larger positive conclusion. That said, neither was I scarred -- emotionally or otherwise -- by my nine years in the Center. Perhaps that will allow me to muse objectively about some very emotional topics in the coming posts. That's Malcolm Gladwell above. Here's an archive of his great articles for The New Yorker. A knock against Ranjana -- never loudly voiced -- had always been her seemingly ever growing circle of assistants. At least that was true when I was living in New York ('85-'90). Even then, she commanded the allegiance of a large segment of the local female disciples and was making inroads amongst some of the men as well. 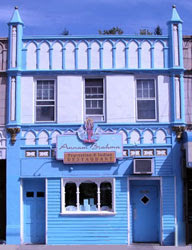 Her influence began at Divine Robe Supreme, a clothing and sari shop that she managed (and perhaps owned), which was dedicated to outfitting the local women disciples. (Guys could also buy their whites there.) Women, it was said, could expect some bad juju if they were found to be wearing saris not purchased at Divine Robe. Ranjana's more direct influence over many of the more dedicated women disciples came with her stewardship of the "Jharna-Kala girls." Guru called his art "Jharna-Kala" or fountain-art in Bengali. The Jharna-Kala girls were basically in charge of managing Guru's art and exploiting it for commercial purposes: making cards, stationary and other small cottage industry items. Not all of the local women disciples belonged -- membership was by invite only. Within the confines of the Center, being a Jharna-Kala girl afforded some measure of prestige. Ranjana's influence and visibility increased marginally in the late '80s when she formed a relatively small group of bhajan or devotional singers. In my last year or two in the Center -- when my enthusiasm was at its nadir -- Guru gave the bhajan singers a lot attention. They were put up front and center to lead some very long, all night devotional singing sessions. Even at the time I was in the Center, I had mixed feelings about Ranjana's growing coterie of assistants and the apparent increase in influence. On the one hand, I saw it as a positive development for women seekers in general. The modern path of yoga -- which I define as those yogic traditions that sprang up in the wake of Sri Ramakrishna (1836-1886) -- has, with few exceptions, been a male-centric path. In that sense, the fact that Guru's two most prominent disciples were women (i.e., Ranjana and Lavanya) struck me as a good thing. And while rumors swirled in some circles that Ranjana could be a bit of a taskmaster, a person had to learn leadership skills somewhere. In my view, that's exactly what Guru was doing, at least in part: teaching Ranjana how to lead by giving her a chance to learn on the job. So, I discounted the importance of such rumors even if they were true (which was not a given). So, from the broader viewpoint of empowering women, I had no problem with the idea of Ranjana's growing influence. On the other hand, however, I found the reality of some disciples being subservient to another disciple to be incomprehensible. To take it even a step further, I found the idea that a disciple would let another disciple act in a subservient way towards herself to be a little repugnant. In other words, there are two sides to a superior-subordinate relationship. First, the subordinate must be willing to submit. Second, the superior must be willing to accept the subordinate's submissiveness. When it came to relationships between the disciples, neither side of this equation computed to me. Even by the mid-1980s, there were both men and women disciples who were treating Ranjana -- with Guru's apparent encouragement -- with veneration. As I've discussed, I like Ranjana and feel some natural kinship with her. But veneration? I didn't get that. I did understand the concept of serving more senior disciples. 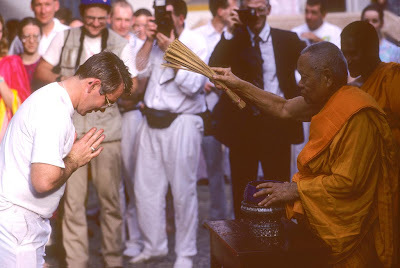 When I was first beginning to transition from a California disciple to a local New York disciple, my closest disciple friend at the time -- Jigisha -- would often remark that by lightening the burden of Guru's closest disciples you could, in a very real way, allow those disciple to serve Guru more efficiently. For example, in my first few months in New York I spent my late night hours washing dishes and cleaning up the Smile of the Beyond, in essence doing work assigned Databir, Bipin and Pulin, while they were up at Guru's house. Had I not helped them, when they got out of Guru's house after midnight, they would have had to do another couple of hours work at the Smile. By helping them -- by easing their burden -- they were able to get another couple of hours sleep and to wake up the next morning a little more rested for another day of service to Guru. And while it's true, I did worship those guys in the commonsense meaning of that word (those three guys were the best of the best), I didn't worship them, I didn't venerate them. Likewise, they never expected (much less demanded) my help and they were extremely grateful for it. It's reminiscent of politicians in some respects. Those politicians who seem so hungry for power always give one pause, don't they? The folks who I feel most comfortable giving power to are those who seem least interested in having it. This, of course, was the great attraction of Lavanya. When I was in the Center, one could not help comparing and contrasting the styles of Ranjana and Lavanya. Where Ranjana was given an increasing authority over a growing number of assistants, Lavanya seemed to reject sycophants. While Ranjana appeared to relish being up front and center, it appeared Lavanya could have done without such trappings. That's not to say that Lavanya was a shrinking violet -- not at all. From the guy's side of the aisle, it just appeared to me that Lavanya -- to use a sporting term -- acted as if she'd been there before. In other words, she was confident in her position and didn't seem to need any outward show of importance. The point of this post, however, is this: while a large staff is often an important indicator of power and prestige, it can just as often serve to undermine the principal's influence. When the staff's loyalty lies elsewhere, the staff can be used to insulate and control the principal. 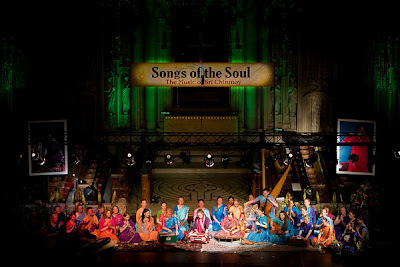 Credit for the photo of Ranjana (center) and her devotional singers goes here.